Data literacy shouldn’t be seen as a barrier but as an opportunity. I love this. 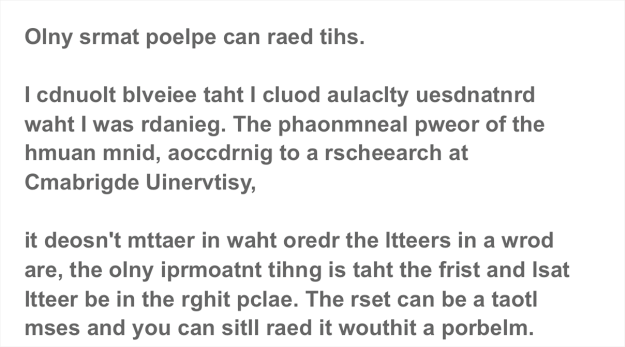 It’s been floating around the web since 2003 and even though it's a hoax (there is no Cmabrgde Uinervtisy research) it still manages to demonstrate just how advanced our literacy skills are. When reading we not only process the letters but the word shapes, sentence structures and also apply our understanding of the context set by what we have previously read. It’s about legibility, readability and cognition. This is the same for data and data visualization, although data literacy is more than simply being able to ‘read’ the data. To be truly literate with data we need "the ability to read, work with, analyze and argue with data" as written by Rahul Bhargava (MIT) and Catherine D’Ignazio (Emerson). But let’s start with reading and seeing the data. One of my favorite design adages is “Readers read best what they read most”. This makes total sense when applied to data and visualizations. Elsewhere on this blog, Patrik Lundblad takes us through best practices for the visual encoding of data. This looks at how we visually perceive values, and it's a great way to tackle the legibility and readability of data. In addition to that, our familiarity with a thing has a strong influence of our ability to understand and make use of it. Often until we ‘have knowledge’ of a thing, we tend to misread. That’s why the safe choice for many audiences is the bar chart. However bar charts are sometimes seen as pedestrian and limiting to those who are a little more literate. So how can we support this diverse group, this range of literacy? Do we always have to bow to the lowest common denominator? 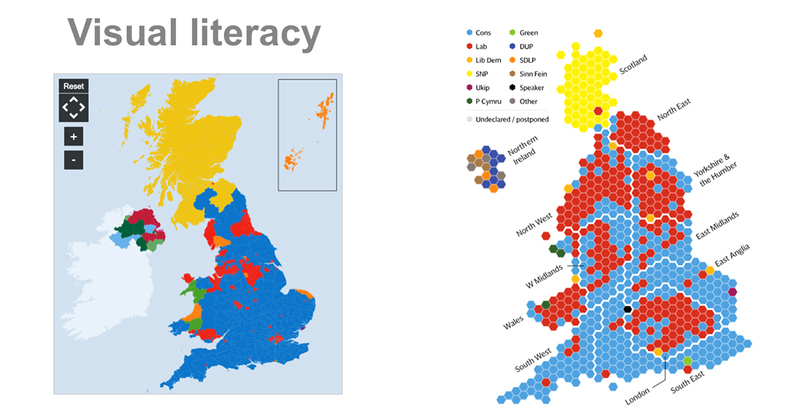 Is your #dataviz on par with all forms of data literacy? It should be. Being able to read the visualization is the first step. However people learn and can improve their literacy very quickly if we help them. That doesn’t mean force-feeding them more complicated and advanced charts. As with many things, people will abandon the difficult and unfamiliar if the change is too great. It’s essential to help people grow at their own pace, to challenge and teach in understandable ways. If a more advanced chart is an extension of a known concept or is delivered in a context that people are familiar with, it is often quickly learned and understood. I spotted a great example of this during the BBC's 2015 UK General Election coverage. 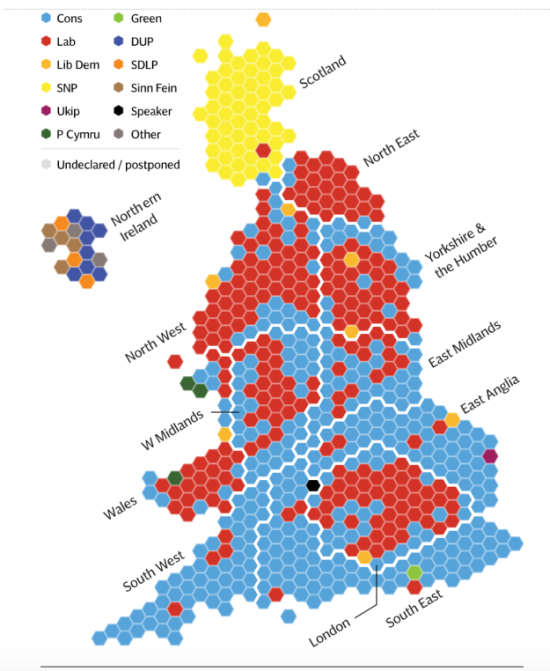 This traditional style map comes from the BBC's online coverage (the live broadcast show used a hexagonal binned map). For years the various news agencies have presented the election results as a map of the UK using a standard geographic projection. Each party is represented by a color and each constituency (seat) is shown using its geographic boundaries. With a general election, the color of the map plays a strong part in communicating the results. By using geographic boundaries some seats appear very small and difficult to see. This can make it a little tricky to visually assess what proportion of seats each party has won. For the 2015 Election many news agencies (in this case The Telegraph) did something a little different. Instead of showing the precise geographic boundaries they switched to hexagonal binned maps, with each seat represented by an equal-sized hexagon. This is a great approach as the UK’s constituencies are based on ‘equal-ish’ sized populations, thus rendering a better representation of the overall result. Of course this does mean that the UK looks a little odd, and Scotland (as usual) gets the raw end of the visual deal. This is not a ‘basic’ data visualization yet it was used for a mass audience, with very diverse levels of data literacy. The important thing here is that it was meaningful, fit the context, and extended a concept that was already well-known. It’s not about adopting the ‘lowest common denominator’; it’s about understanding the usefulness for a broad range of people. By carefully selecting and framing the data visualization we can introduce people to more sophisticated forms. As familiarity grows, these new forms enhance data literacy. So when considering these forms, think about how to introduce them. Ask yourself how can I frame this so that someone who has never seen this approach before will be able to read it without needing complex explanations.